The 32 km Vic Green Belt encircles the entire city, much of it running alongside the courses of the city’s two rivers, the Gurri and the Mèder. Most of the area covered by the route has been recently restored. 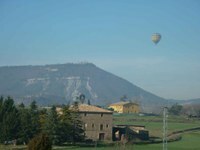 A wide variety of landscapes can be observed along the route, offering something for everyone. The Vic Green Belt showcases the city’s cultural and historical assets. It takes us along paths and through crop fields and other landscapes shaped by humans over the centuries. It gives structure to a cultural landscape that enables us to discover resources and forms of social organisation through history. At the same time, it explains how the city has evolved and how the urban area has been shaped. A mere stone’s throw from the city centre and old quarter, the Vic Green Belt is a place for exercise and strolling, for contemplating the city from a distance at which its growth can be appreciated, or simply for making the stress of daily life disappear. For those who enjoy sport in a natural setting, it’s a great place to go without having to travel further afield in search of unspoiled nature. The Green Belt connects the city centre to its surrounding natural and cultural landscape, generating endless elements for environmental education and encouraging reflection on sustainable development. It offers information on the characteristics of our environment, fostering appreciation and respect for it. The Green Belt is a great way to discover the rich rural architectural heritage of Vic. Farmhouses such as El Pujolar, El Franch, Can Fontarnau or Sant Joan del Galí give us insight into what life was like in the central area of the Vic Plain. We can also enjoy the beauty of these buildings that have stood for centuries. 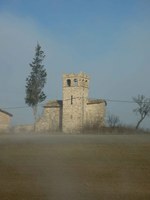 The same is true of other types of buildings, such as the ancient Church of Sant Martí de Sentfores. This Romanesque church and its immediate surroundings offer a stunning panoramic view of the entire municipal district, including all the elements included in the Green Belt. The Vic Green Belt project restores heritage elements that have been lost in recent years, such as springs. These sites hold plenty of social and cultural interest, since they were traditionally places where people would go to enjoy nature and some peace and quiet They are also home to communities of plant species typically associated with hard-water springs. At the same time they are important sites for the reproduction of invertebrate fauna and for some amphibians, such as salamanders, and serve as watering places for birds and mammals. The Green Belt is the place to go to discover monumental trees, flora and woodland. 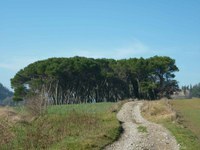 Examples include the Pujolar Pine Grove, the Cantarell Oak Grove, the London planes of Jaume Balmes Park, El Prat Park and Carretera Barcelona, the horse chestnuts of Sant Pere Spring and the hawthorns of Puig dels Jueus, among others. The inselbergs or island mountains are also noteworthy geographical features, shaping and symbolising the unique, distinctive landscape of the municipal district of Vic and of the Vic Plain as a whole. Important examples include the hill of Puig de les Guardioles, the hill of Puig dels Jueus and the hill of Castell d'en Planas. The fauna of the rivers and of the rest of the municipal district is another key element for enjoying the natural environment close to Vic. The Green Belt coincides at various points with important national, regional, county and local routes: the Way of Saint James (which crosses Catalonia); the Paths of Bishop and Abbot Oliba GR151 (from Montserrat to Prades); the popular path that runs from Vic to the Monastery of Sant Pere de Casserres (PR C40); the environmental route around the Gurri River, Els Frares Spring and Bruguer Bridge; the route around the Mèder River and La Guixa; and the route from Vic to Sant Sebastià. It also coincides in some places with the mountain bike routes of the Vic Plain MTB Centre (the welcome point of this centre is located at the Canonge Collell Hostel in Vic). The Green Belt has its own signposting, giving a cohesive and uniform look to the entire route. There are vertical signs with directions and information, located in strategic points of the city: Plaça Mil·lenari, Camí antic de Malla, Carretera de Roda and Camí de Taradell. These vertical signs display the entire Green Belt and all the routes that coincide with this circuit.